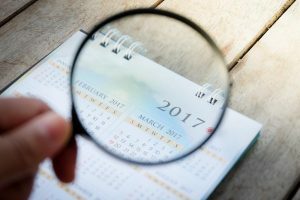 The calendar is a gold mine for brand builders in the consumer package goods (CPG) space. At Barefoot Wines, we used the calendar to lay out our brand building strategy two years in advance. We didn’t just look at it, we studied it! We wanted to understand the natural cadence that was caused by the seasons, holidays, bank closures and 3-day weekends. We were especially keen on the time between the holidays that varies from year to year. “Where was St. Patrick’s Day in relationship to Easter?” and “How much time between Labor Day and Halloween?” and “What weekday does Christmas and New Year’s fall on?” are the questions we would ask. We wanted to know how many selling days were in each of the selling periods preceding the 3-day bank-holiday weekends. This would give us the backbone of our marketing and merchandising calendars. The calendar study showed us when we had to be in place with seasonal point of purchase materials, and the lead time to develop and print them. We could see how much time we had to sell, deliver, and install displays that utilized those seasonal materials. Every annual marketing strategy is divided by seasonal marketing periods, most punctuated by the 3-day bank holiday when one period ends, and the next one begins. We have identified seven: MLK Day, Easter (not a bank holiday, but with Good Friday, a 3-day weekend), Memorial Day, Independence Day, Labor Day, Thanksgiving, and Christmas/New Year’s. If Valentine’s Day (February 14th), falls on the Friday, Saturday, or Sunday of the Presidents Day weekend (celebrated on the 3rd Monday in Feb.), then it’s the “Valentine’s Day Weekend” as well. This means that there will be time off for romance and all that entails in terms of products and services to enhance the occasion. The marketing period will begin in earnest starting the day after MLK Day. If St. Patrick’s Day (March 17th) is separated from Easter (which falls anywhere between March 23rd and April 25th) by a week or more, it can be its own selling period, starting the day after Presidents’ Day. Father’s Day is the 3rd Sunday in June. So, if June starts on a Saturday or Sunday, it will be far enough from Independence Day to start marketing for Father’s Day the day after Memorial Day, and still have a few weeks to market Independence Day. Then there’s the annual events like Super Bowl Sunday and The World Series. The ethnic holidays of Passover, Chanukah, Kwanza, Chinese New Year’s, and Cinco de Mayo add flavor to this marble cake of days, dates, and lunar cycles. The Olympics and the elections add their weight to this already complicated road map every 2 and 4 years. Are you able to follow this? Pull out your calendar, because your success depends on it. Show your retailers that you’ve done your homework. Show them you have the year all laid out for them with the seasonal promotions to help them sell. Reserve your display space a year in advance if necessary. Show them how your seasonally specific marketing materials will make them part of what’s happening on the calendar! It worked for us and it can work for you!